Oh BOY! Have I got an exciting Easter Review AND Giveaway for you guys! I contacted Personal Creations and asked if they would like me to do a review and/or giveaway for them for Easter. And when they responded back I was SOOOO excited. They let me pick out what I would like and I wanted to get something for the kids that would last. I knew they had some really cute t-shirts and decorations...they have a little bit of everything. But I wanted something that they could keep as they get older. I don't have pictures of the ones that I received. Shhh...they are hiding in my closet! 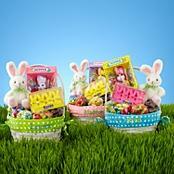 But this is what I chose - the Easter Basket Bundle. Gracie got the pink with green lettering. And Matthew got blue with yellow lettering. I ♥ them!! I'll be adding additional goodies to it. ONE lucky winner will receive a $50 gift code to use for ANYTHING at Personal Creations. To enter to win visit Personal Creations and leave me a comment telling me what you'd like to use the $50 for (along with an email to contact you if you are winner). Additional entries can be earned by liking Personal Creations on Facebook. Giveaway ends on April 20th at 11:59PM EST. Winner will be chosen using Random.org. Lesley, I would love to win this so I could send Easter goodies to my nieces and nephew in Colorado this year. I've always wanted to do that, this would make it much easier! Awesome giveaway!! They have great stuff! Love to get the baskets of course, the step stools with names (though I know they'd never have my kids' names LOL), the Mom jewelry! Love it all! I'd probably pick the 'Character Charm Necklace With 1-3 Charms & Kids Puzzle-Name Coat Rack'.